The VOLT2 is the ideal glider for XC-orientated pilots who are looking for a high-performing wing, packed to the brim with cutting-edge design technology. Featuring a completely new construction, yet following the virtues of its predecessor, the VOLT2 showcases far greater performance whilst demonstrating well-balanced flying characteristics and behaviour. The original VOLT stood out from the crowd as a great performing classic EN-C. It was an impressive climber that provided solid feedback, balanced with flying characteristics that highlighted our renowned comfort-in-flight feel that many refer to as ‘rock solid’. The main objective that we have achieved with the VOLT2 was not to position this glider within the outer limits of the EN-C category from a handling and comfort perspective, but to offer outstanding outer limit performance. Launching In flight, you’ll be highly impressed with the VOLT2’s agility and responsive nature. Turning is sharper with direct feel, ensuring that turning into thermals provides the pilot with perfect feedback from the canopy – allowing you to feel more connected to accurate coring. Stability has been increased by the implementation of a prominent shark-nose. The VOLT2 features race lines, highlighting a completely new line-geometry that provides a line reduction. On each line level there are now just 2 main-lines (2A, 2B, 2C), which reduces the total line length (29m/10% @size M), reduces drag, and greatly improves performance. Our newly designed airfoil is one of the key elements to the VOLT2’s class leading performance. 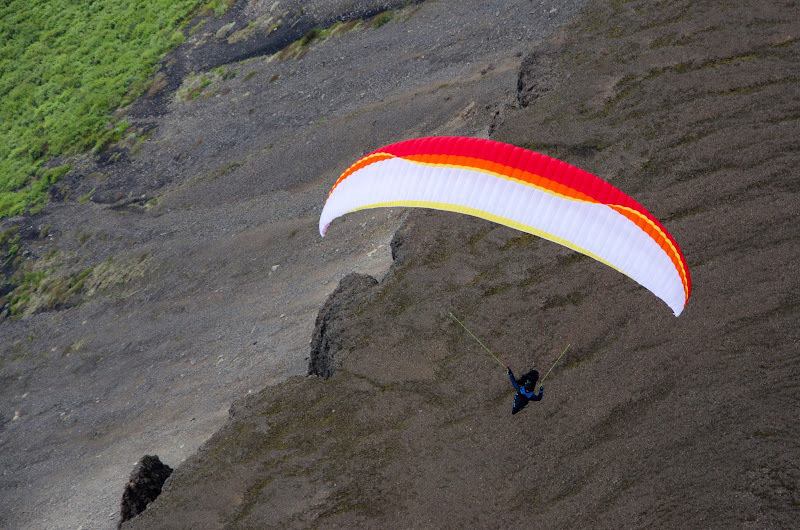 The glider remains extremely balanced in moving air and demonstrates improved climbing characteristics, especially in headwind tasks. These efficiencies mean you’ll be delighted to be arriving at your destination faster and higher than ever before. The VOLT2’s riser system has been developed specifically to provide best performance under acceleration, and features ergonomic rear riser steering loops. Bar pressure has been reduced, and you will immediately recognise that bar travel in its entirety provides usable speed without the ever present threat of dropping off. • Nose-Wires are polyamide rods in the leading edge keep the profile in perfect shape and improve stability and launch characteristics. 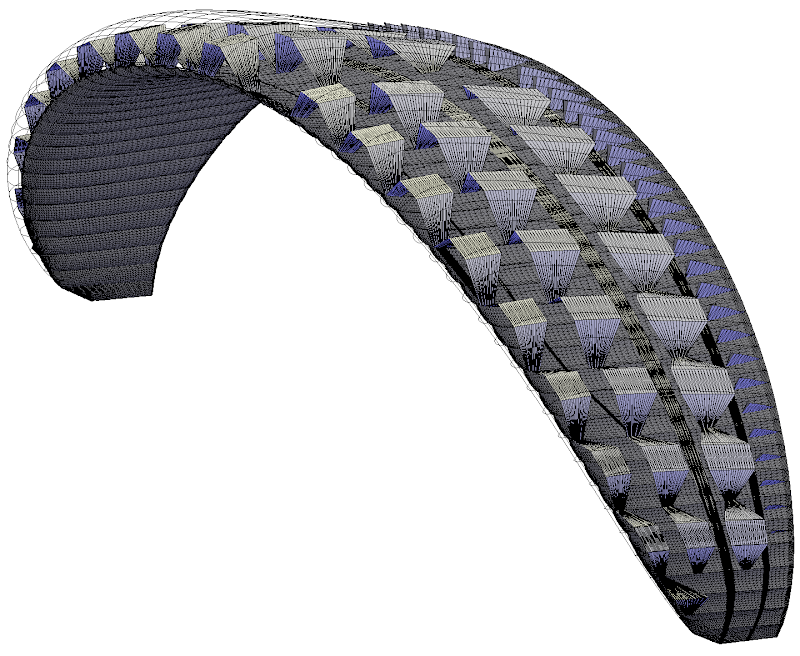 • Razor-Edge L/E - A specially designed trailing edge which optimises the profile and reduces drag. • Mini-Ribs, in the trailing edge improve surface finish and reduce drag. First flight on the VOLT 2 - personal best at Speikboden 214 km FAI! I launched and felt imediatly at home. I was flying the glider on the top weight range and I noticed that the glider is faster than its predecessor. The canapoy is very stable and precise in feedback. The break pressure is reduced compared to the first VOLT but still progressive. I was stunned by the improved climbing characteristics. The glider gave me a lot of confidence so flying accelerated underneath the clouds was amazing. You feel the energy of this glider while coring a thermal and because of it´s stability not even the wing tips are comming in. As the glider is constructed with only 2 main-lines, big ears are very efficient and stable. But the best part of the flight was at the end around eight o´clock in the evening. I was gliding down Ahrnthal with tailwind and then the conversion started and I was able to get to the landing field! A perfect day with this new glider and many more to come! First flight and my new personal record of a 199,55 km FAI with an impressive 26,47 km/h average speed! Very curious about the sucessor of the original VOLT I got one of the fist demos and went to Speikboden together with Robert. All ready in the first thermal I felt very comfortable. The glider feels sharper and more agile while thermaling. Quickly I found myself at cloudbase and soon after I was testing the performance of accelerated flight. I was surprised of the improved gliding and stability. The glider is still giving accurate feedback so I stayed accelerted even in turbulances. The result of this day showed this with an impressive 26,47 km/h average speed. This is a hughe step forward for me. After 7,5 hours of flying and a big smile on my face I was sure that I will achive my true potential.